We offer instant brochure printing services to meet all your brochure printing requirements including half fold and tri-fold brochures. You just have to choose the design and type of brochure you want, and we will print as many brochures as required ranging from 50 to as many as 100,000 brochures. We have some standard brochure sizes for you to choose and if required, we also offer customized brochures with special folds and paper materials. Choose the brochure you want from various paper printing options like matte, gloss or plain paper finishing, and if required, we can also add a special touch with a coating. 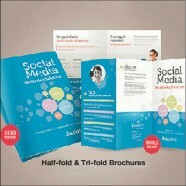 We take pride in offering instant brochure printing service where we can produce your brochures in a day of your order. To top it all, all our printing jobs are backed by the experience and satisfaction guarantee provided by our team of highly proficient professionals.